John David Culpepper and Amy Louise Murdock on 13 Jul 1913 in Thomas Co., GA, Book R-140. Amy Murdock Culpepper, Leon Co., FL, White, 05 Dec 1889 - 02 Mar 1978. + Amy Murdock Culpepper, 5 Dec 1889 – 2 Mar 1978. Amy Culpepper, Wife, F, 28, M, GA/GA/GA. John D. Culpepper, d. 16 Feb 1964 at 79 years in Thomas Co., GA; Res. in Thomas Co., GA.
Palestine P. Culpepper and John R. Luke on 10 Jan 1888 in Thomas Co., GA.
Effie D. Luke, Niece, F, Aug 1897 (2), S, GA/GA/GA. William R. Cullper, Son (of Kate), M, 9, S, GA/GA/GA. J. H. Culpepper and Lilla Annie Eddings on 24 Feb 1907 in Thomas Co., GA, Book P-287. + Bonnie I. Culpepper, 14 Feb 1915 – 23 Dec 1983. Curtis Culpepper, Son, M, 1, S, GA/GA/GA. Herman Culpepper, Son, M, 3/12, S, GA/GA/GA. Emmett Culpepper, d. 24 Sep 1945 at 33 years in Glynn Co., GA.
Henry Culpepper, Son, 4, GA, GA, GA.
Aubrey C. Culpepper, d. 10 Sep 1981 at 59 years in Wayne Co., GA; Res. in Wayne Co., GA.
William Culpepper and Bell Annie Mae Clarence on 12 Feb 1936 in Thomas Co., GA, Book X-453. E-mail written Aug 2004 to Warren L. Cuulpepper from Christine Culpepper McGoogan, e-mail address. Henry Culppepes, Boarder, M, Wh, 24, sng, GA/GA/GA, Laborer on Farm. John H. Culpepper, d. 27 Jun 1962 at 82 years in Wayne Co., GA; Res. in Thomas Co., GA, # 20943. William H. Culpepper, d. 19 Oct 1977 at 71 years in Thomas Co., GA; Res. in Thomas Co., GA.
Curtis F Culpepper, White, Single, born 1909 in Georgia, residing in Thomas Co., Georgia, enlisted as a Private in the US Army on 26 Sep 1942 in Fort McPherson, Georgia. Curtis F. Culpepper, d. 31 Dec 1982 at 73 years in Thomas Co., GA; Res. in Thomas Co., GA.
+ Benjamin F James, 1912 - Jan. 9, 1987 [Parents: Henry Timothy James (1870 - 1944) and Fannie Melissa Wright James (1883 - 1960)]. Find A Grave Memorial# 30760272. Brunswick News, Brunswick, Glynn Co., Georgia. Obituary of Bernice Brim Culpepper, published 7 Sep 2005. Bonnie Carter Culpepper, Cert 105358, Leon Co., FL, White, 14 Feb 1915 - 23 Dec 1982. B. C. Culpepper, d. 23 Dec 1982 at 67 years residing in Thomas Co., GA.
Obituary of Marjorie Culpepper, published in the Shreveport Times on Apr. 5, 2015. Steve C. Culpepper, White, Married, born 1916, Enlisted as a Private in the US Army on 22 Apr 1942. Marie Elizabeth Culpepper, 20 Sep 1920 - 8 Dec 1920. E-mail written Jan 2006 to Warren Culpepper from David Rich, Class of 1978 & Secretary of the West Point Society of Tallahassee, e-mail address. 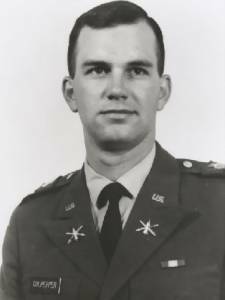 Allen's obituary appeared in the November 2002 edition of the Assembly, a West Point publication for graduates. Marck Allen Culpepper, Male, born __ 1976 in Harris Co., Texas, child of Douglas Orville Culpepper and Regina Dean. Dean Orville Culpepper, Male, born __ 1976 in Harris Co., Texas, child of Douglas Orville Culpepper and Regina Dean. E-mail written 2009-2013 to Warren Culpepper from Marc Allen Culpepper (#6837), e-mail address (Mar 2013). Dr. Culpepper's experience lies in the areas of physical education and sport and exercise psychology. Before coming to LCU, he has taught at the University of Houston, and the University of Wisconsin-River Falls. He has collaborated with researchers at the Baylor College of Medicine and the Mayo Clinic. Since 1999, Dr. Culpepper has been certified to teach in Health and Physical Education. He believes that physical education will be a focal point in helping reduce the obesity epidemic in our nation's youth. For the past 5 years, Dr. Culpepper has served as a sport psychology consultant to elite performers in the U.S. His experience as a sport scientist, collegiate coach, teacher, and athlete brings skills and experiences to help athletes and students perform at their optimal level. Dr. Culpepper received his Ph.D. at the top doctoral program in the nation, the University of Houston. The latest Academic Analytics' Faculty Scholarly Productivity Index, an independent ranking of doctoral programs in research universities across the country ranked the University of Houston's Department of Health and Human Performance No. 1 among colleges and universities with health, physical education and recreation programs. Source: http://www.lcu.edu/ (Retrieved 12 Feb 2010). E-mail written Dec 2009 to Culpepper Connections from Dean Orville Culpepper (#6838), e-mail address. E-mail written 1999 - 2016 to Lew Griffin from Nada Joy Hyde, Chattanooga, TN, e-mail address.